Founder and CEO of Paris Residence Club, Walid Halabi, has announced the launch of a series of webinars aimed at educating consumers about fractional ownership. 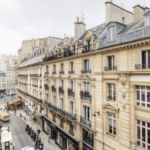 The first webinars will begin on August 1st and 2nd and will cover topics ranging from the basics of fractional ownership to specific questions about the Paris Residence Club. The webinars follow Paris Residence Club’s “Meet the Developers” U.S. Tour which kicked off earlier this summer with stops in New York City and Washington DC. Their next event is planned for a Los Angeles stop in July. Click here to read the full press release or visit the Paris Residence Club website.